You may have heard of the term “Highly sensitive person“ (HSP). Those 15-20% of our population who are born with a nervous system that is highly aware and quick to react to everything. Since you don‘t become highly sensitive at some point but you are from birth on, there are the so called “Highly sensitive children“ hidden in our world. They “grasp subtle changes, prefer to reflect deeply before acting, and generally behave conscientiously“ (Elaine Aron). They are also easily overwhelmed by high levels of stimulation, sudden changes, and the emotional distress of others. Because children are a blend of a number of temperament traits, some HSCs are fairly difficult–active, emotionally intense, demanding, and persistent–while others are calm, turned inward, and almost too easy to raise except when they are expected to join a group of children they do not know. But outspoken and fussy or reserved and obedient, all HSCs are sensitive to their emotional and physical environment. We want to ask you this: What do you think would happen if we raised ALL children AS IF they were highly sensitive ? And by that we don‘t mean carefully protecting your child from any uncomfortable or overstimulating situation in the world. We mean: when it comes to their emotions – acknowledge, understand, respect, respond and empathize. Elaine Aron developed a questionnaire to see if your child is highly sensitive or not. It contains questions such as “Does your child startle easy?“ or “Does your child want to change clothes if wet or sandy?“. But it has also questions like “Does your child use big words for his/her age?“ or “Does your child ask deep, thought – provoking questions?“ in it. Well – you wouldn‘t know until your child was about 3, 4, or 5 years old. What about the 3 years before that? 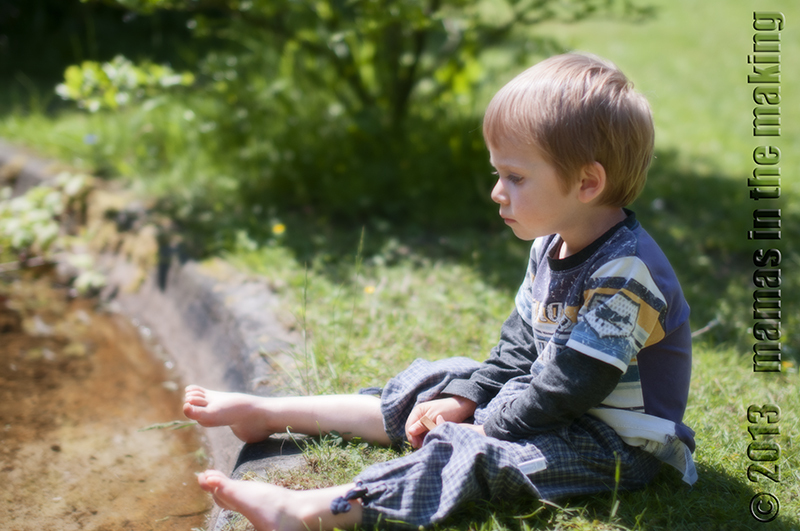 You may not realize that your child is “different“ than others until you become aware of him playing rather quietly on his own than with a group of children, of him talking more or more meaningfully than other children. You may not be surprised by him not liking getting wet and sandy on the playground but see it as something he might get used to eventually. But the first 3 years of life are crucial. And while we don‘t want to put a diagnosis in your head and consider your child to be highly sensitive we want to raise awareness to sensitivity in general. Our culture is performance driven. You need to function and you need to function well. There is no time to be wasted to become independent, learn the basics in life and an instrument too. Good manners, the rules of our society and strategies to protect yourself, to compete and become successful. Sensitivity does not really fit in well here. It is usually combined with thoughts of shyness, fearfulness or fussiness. How can a person like that become successful and self-confident? And so many parents tend to “toughen up their child“. A small scratch, a minor accident with the tricycle or the wrong coloured cup on the breakfast table are said to be “nothing“ and “not a big deal“. Get over it and move on. That‘s life! But does preparing children for a harsh world by being harsh to them really work? What if it is true what Robin Grille (and countless others) suggest – that things like violence and war are not a political but a psychological issue? Wouldn’t it then make sense to celebrate sensitivity in our children in hope that we are raising sensitive people, who understand their own feelings and those of others; who know what they feel and are not afraid of these feelings; who are okay with being sad, angry and scared, as well as being happy and excited? Dr Emmi Pikler and Magda Gerber both advocated an approach to child rearing, where we – parents, caregivers – respect the child for who he is. We believe this also means respecting their feelings and emotions. Even if we sometimes disagree. Even if we don’t understand. Even if they trigger in us something we can’t quite put our finger on, but that makes us uncomfortable. What would it require us as parents to do? Acknowledge our child’s feelings with respect. Respond, even if you don’t know what it is they are going through. And while we would more often than not want to say that it doesn’t matter, it matters deeply to our child in that moment. And in fifteen years’ time we will probably think fondly of those moments and want them back. So is it really too much to ask? It doesn‘t mean protecting your child from any situation that could be harmful. It doesn‘t mean compensating pain or fears with physical contact. It means RESPECTING all sorts of feelings and emotions and RESPONDING to them. It means letting our children do the work of preparing for the world “on their own, with our help”, rather than pushing them to do it faster. Perhaps one way of doing this is by celebrating our children’s sensitivity? What do you think? We can’t wait to hear your thoughts! One afternoon Antek woke up from his nap, had something to eat and went to play in his room. I peeked in to see what was going on, and I noticed he kept throwing his teddy on the floor, then picking it up and throwing it again. He doesn’t usually throw toys, so it had me wonder. I moved closer and was listening. ‘You fell down. It hurt’ he said picking the teddy from the floor. ‘Do you want a hug?’ A little break and the cycle went on again. And again, and again. Until he had enough and moved on to play with his cars. Later in the evening, my husband told me Antek had fallen down on the playground and cried for quite a long time – nothing major happened, but clearly it had upset him quite a lot. It is often difficult for children to express what they feel. It is probably often difficult for adults, as well. But there is a lot going on emotionally we are working through all the time, and we need tools to deal with it. For children, one of these tools can be FREE PLAY. Free, that is self-initiated, self-led and uninterrupted (as intended by Dr Emmi Pikler and Magda Gerber). Of course going through big emotions more often than not requires our (adults’) help. Again, it does not mean to leave the children alone at all times, and let them figure out the world without our guidance – it simply means to be sensitive to when and how to allow play to be a healing tool without jumping right in with our assumptions and expectations. Given time and space, children, scratch that – people, who are nurtured and whose needs are met, can on a lot of occasions work through their own problems in their own play. Or in their own way. We talk, if we can. We doodle on a piece of paper for hours. We kick things. We scream. We run, or go outside. We lie in the grass, go hug trees, go for a swim. Kids also work through their emotions in a way which helps them cope and understand. If nobody steps in to stop or ‘help’ in the process, the play itself can sometimes become a self-organized therapeutic tool. There were definitely some emotions with Antek falling down that day. He got hurt. He didn’t like it. He was surprised how much his knee hurt. Had anyone stepped in to stop the throwing, or to ask what happened, the process of going through this could have been stopped. In one of the videos from the Pikler home, there is a scene with one little boy who keeps hiding his toys up really high, where he can barely reach them. He then walks away, looks at the shelf, and comes back to try and reach for the toys. He does that several times, always making sure he cannot see them, and then always returning to make sure they are there. This little boy, we were told, had not been there for too long. It was still the time when Pikler home was an orphanage. His parents, who could not care for him at the time, came to visit him every week for a little while. After they’d left, he immediately went to play his ‘game’ of hide-and-seek. Why is this interesting? Perhaps because of the amazing connection this little boy was making between his parents disappearing every week, to appear in the next. Perhaps this game helped him to understand reality, and reassured him that things that go out of sight can be brought back. Perhaps he was testing the permanence of objects, which had affected his life to such a great extent – his parents were constantly in and out of his sight, after all. We have already talked about Antek’s fear of planes, and how he managed to combat it by practicing getting into and out of the plane, sitting down, preparing his bag (http://mamas-in-the-making.com/2012/10/our-boys-and-their-toys/). Going over some things children are afraid of, or have doubts about, often appears in play as a way of making them familiar. A lot of our fears are born out of a fear of the unknown. If we know what is coming, we can prepare – which is why talking to our babies (even very small) through the events of daily life helps so much in the long run – it makes the world a little more predictable, and through that, less scary. In their play we often see children doing something over and over, repeating certain actions – sometimes we can make a clear connection to a real-life event (like getting on a plane, or going to the doctor), and sometimes it is too abstract for us to see. But if we manage to allow our babies to develop the habit of free play, they will also use it to deal with their fear of the unknown – by finding their own ways of making it known and familiar. Have you noticed your child dealing with emotions, fears, or reliving past events in their play? We love to hear your thoughts! Janet Lansbury talks about ways to encourage free play as a tool for self-therapy here.